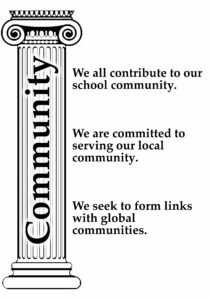 Our school community has worked together to establish what our school vision and values should be. We communicate our vision by way of a classical temple: the heart of a community which conveys strength, spirituality, and solidarity. Our vision is simply that everyone can achieve their highest potential and ambition through daily personal and academic excellence. It is our belief that the pupils at Dean Trust Ardwick have no limit to their potential. We all share the vision that everyone can achieve their highest potential and ambition, whoever they are. 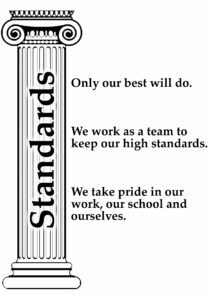 It is our job to provide the right school ethos and environment to help pupils achieve this. 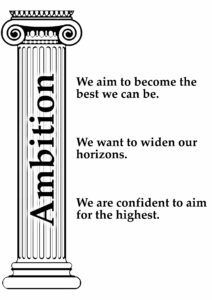 We do this by encouraging pupils (and staff) to aim for daily personal and academic excellence, which means that supported through our high standards we all learn to be the best we can be, which of course, is our highest potential, and should be our greatest ambition. 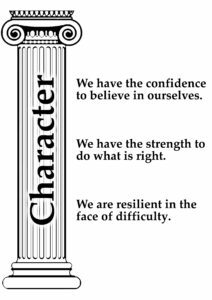 Our vision is supported by the five temple pillars. 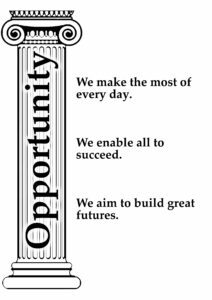 Click on the images below to find out how these pillars support our pupils to achieve their potential and ambition.